Every year at Christmastime, Chris’s friend Joe Johnston has a little side-hustle. 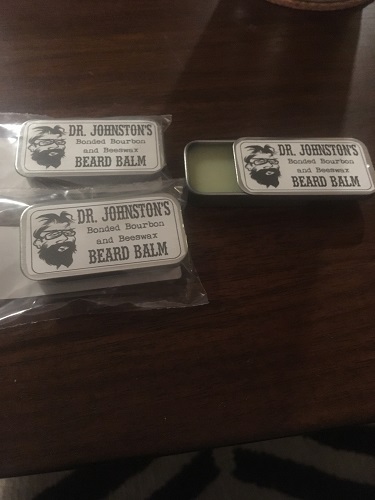 He buys some tins and some stickers and whips up a batch of his own personal concoction — Dr. Johnston’s Bonded Bourbon and Beeswax Beard Balm. For the facially hirsute among us who are going through the heartache of mid-winter beard dryness and itchies, perhaps you’d enjoy Dr. Johnston’s proprietary blend of beeswax and Kentucky bourbon to get your beard soft and supple during the dry season. To answer your questions: is it scientifically formulated? Let’s ask Dr. Johnston himself. He says, quote, “I’m no scientist.” So maybe it’s not the remedy that 4 out of 5 beard doctors recommend most. But tell me truthfully, wouldn’t you enjoy the feeling of getting bourbon all over your beard *on purpose* for once? Three servings, each in its own attractive tin, with two drawings: one raffle will contain a single tin of Beard Balm for the weekend beard hobbyist; a second raffle will contain *two* tins of Beard Balm for the Billy Gibbons impersonator in your life.